Kirsten Mansfield watches the action. The junior defender scored the game-winning goal against Boston College in double overtime. Last September, Boston College handed Northwestern a heart-breaking loss in double overtime. This year, it was the Wildcats’ turn. Locked in a back-and-forth 2-2 contest and dealing with the high stakes of the “golden goal” overtime rule, senior midfielder Eva van Agt sauced through the Eagles’ defense in the 82nd minute and threaded a perfect pass to junior defender Kirsten Mansfield, who slid it home to give No. 12 NU (2-2) the 3-2 victory Sunday. It was a dramatic ending to an uneven weekend for the Cats. After holding their own last weekend against defending national champions No. 1 Connecticut, NU looked completely outclassed Friday against No. 3 Duke. The Blue Devils piled up 24 shots and put 15 shots on goal in their dominant 4-0 victory. In comparison, the Cats could muster only four shots, all in the second half. 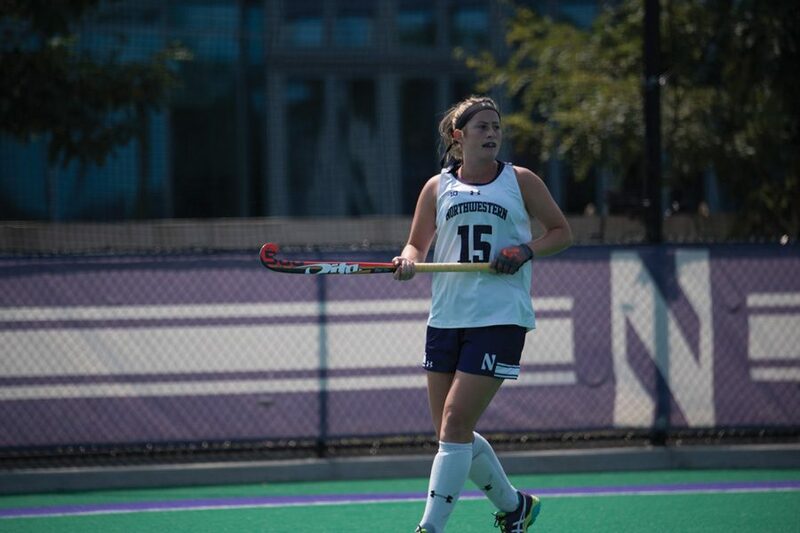 NU earned only one penalty corner all match, while Duke had six, one of which led to a goal. Sophomore goalkeeper Florien Marcussen got her first career start against Duke and kept the Blue Devils off the scoreboard in the first half, making five saves amidst a barrage of 13 shot attempts. However, things went downhill as Duke scored all four of its goals in the second half, and Marcussen ceded the net to junior Annie Kalfas, who started all 22 games for the Cats last season, on Sunday against No. 13 Boston College. Kalfas made nine saves while allowing only two goals. Unsurprisingly, NU’s offense was driven by senior midfielder Puck Pentenga. Pentenga had two goals, and her midfielder partner van Agt dropped two assists as the Cats’ offense bounced back from its disappointing performance Friday. NU has now played four games, all against ranked opponents, and held its own in three of those four. Last year, the Cats went 0-6 in games against top-5 opponents, including a 1-0 loss to then-No. 2 Duke and three losses to Michigan.